This is how to add drawers to your shop to maximize the space. If you are working in a smaller shop, adding drawers under benches and tables is a great way to increase the available storage space without taking up more floor space. Most hobby woodworkers have a small shop in either the basement or the garage, and space can be pretty rough to find. In a small shop, anything you can do to make the place feel bigger is a huge win. Adding drawers is just one of them. I discussed adding drawers in my post called 29 Great Ways to Maximize Your Woodworking Shop Layout, as well as several other ways. If you have a small shop and you want to make it feel bigger, there are several great ways to do it in the post. When you put a drawer under a bench, you lose zero floor space. This is because the bench is already taking up the space. When you put something under it, the footprint remains the same, and you lose no additional floor space. If you were to make a set of drawers and add it to the shop, you would end up reducing the amount of space on the ground. If you absolutely need space, this will work. However, you can add the drawers under the benches you already have instead. This is a great option for a couple reasons. First, you already have a lot of structure in place, which means less work. A bench will already provide much off the carcass, meaning you have to work less to make your drawers a reality. Another thing that making drawers to help conserve space can do for you as a beginning woodworker is that you get a great beginner project out of it. Drawers are not as easy as they look, but they are well within the reach of any new woodworker. Even seasoned woodworkers can make a bit of a challenge out of it. Instead of making the drawers really simple, maybe do some dovetails or finger joints? That can add some strength to the drawers and also add a little bit of a challenge. 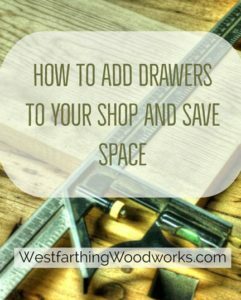 As a true beginner, even simple drawers will get you doing some of the things that you will need to know how to do in your woodworking career. This includes measuring, making straight cuts, attaching pieces of wood together, and installing glides or runners. 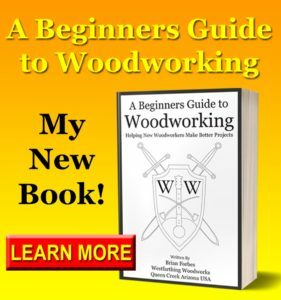 If you like beginner woodworking projects, These Beginner Projects are a lot of fun, and are perfect for any new woodworker. If you really like drawers, you can just go nuts and make a ton of them. Any table or bench on your shop that has a bottom with some open space is a candidate. This means a lot of space for drawers in most shops. Think about what you like to use near each tool, and design your drawers so that they can fit the things you need to use. For example if you have a drawer near the lathe, make sure that you can fit your chucks, tools, and wrenches inside. Drawers should also look similar, so if you place three drawers next to each other under a bench, make them all the same height. This also makes the milling process easier, because you can knock out the parts rapidly without as many saw setting changes. Your homework is to go out into you shop and look under all of your tables and benches. See if you can add some drawers to the area, and what you can store inside them. Odds are that you have several places you can add drawers. If you are a beginner, these drawers will serve you well. Not only will they create a nice storage space for your tools and materials, they will also teach you about woodworking. Making drawers is a fun challenge, and mounting them on glides can be an experience in the beginning too. Make a Sanding Block following my tutorial, and you will have an easy tool to break the edges of your new drawers. Look around your shop, and see if drawers are right for you. Maybe even just start with a couple nice drawers under your main bench. These are always going to be close to you while you work, and will encourage you to use them. If you are working in a small shop, you can really benefit from doing a few things to make the shop feel bigger. One of these ways is to add drawers under the existing benches and tables that you already have in place. Since the floor space is already spoken for, when you add a drawer under the top, you do not take up more floor space. In fact, you increase the usefulness of the floor space, because you are storing vertically instead of horizontally. Drawers are also a great beginner level woodworking project, but you can add things to make it more complex like dovetail joints or finger joints. Either way you go, using drawers can give you more storage space, and keep the tools you like to use right in your reach.